Spurs split their games but show signs of increasing consistency. Week 4 was a short week for the San Antonio Spurs with only two games. The week started out with what seemed to be a repeat of the loss to the Orlando Magic when the Silver and Black came out slow versus the Miami Heat and were called “soft” by Gregg Popovich. After returning home, the Spurs answered Pop’s challenge and came out hot versus the misfiring Houston Rockets. 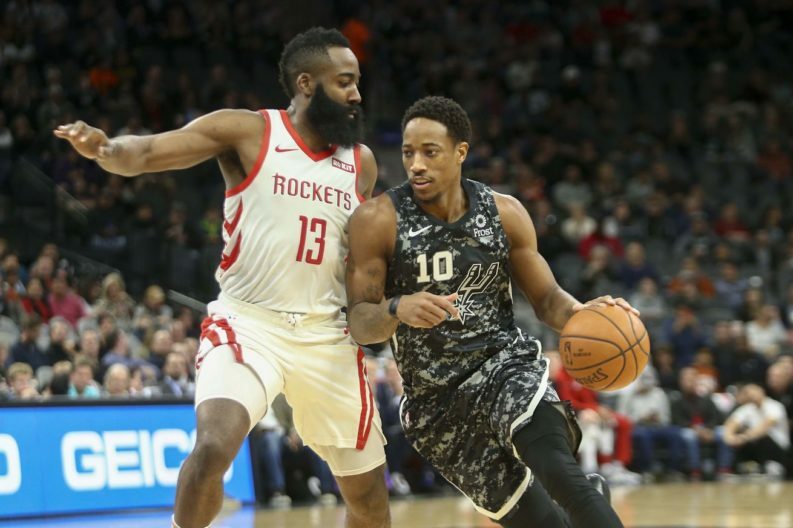 While LaMarcus Aldridge and DeMar DeRozan had rough shooting nights, the defense was improving (the Spurs were ranked #1 in defense for the last two weeks for holding the Heat and the Rockets to under 100 points) and Derrick White showed fans glimpses of what he could be at point guard until Dejounte Murray’s return. Week 4 – You Win One, You Lose One: The defense is definitely showing signs of returning to old form, but poor shooting nights from the Spurs’ two All-Stars led to a split this week. Last week: 1-1 (7-4) – 88-95 vs. Heat (Loss); 96-89 vs. Rockets. The Spurs got some much-needed guard depth with Derrick White making his season debut last week after being sidelined by a left plantar fascia tear. But now the injury bug is spreading throughout San Antonio’s frontcourt. Rudy Gay (heel), Pau Gasol (foot) and Jakob Poeltl (ankle) are all missing time, making a team Gregg Popovich recently ripped as “soft” really small. Over the first two weeks of the season, the Spurs ranked 30th defensively. Over Weeks 3 and 4, the Spurs rank first defensively, having held five of their six opponents under a point per possession. Improvement has come on the perimeter; Their opponents’ effective field goal percentage from outside the paint was 55 percent over their first five games and has been just 40 percent over the last six. They’ll face some better offenses later this week, they play eight of their next 10 games on the road, and they’re dealing with injuries to Rudy Gay and Pau Gasol. They did get back Derrick White, who was put right into the starting lineup and who had 14 points and eight assists in their win over Houston on Saturday. When Patty Mills is your leading scorer with 20 points on 22 shots on a night Hassan Whiteside completely dominates the interior, all you can do is move on to the next game. Doing just that and beating the Rockets to add stress to their pressure-filled start is the most Spurs thing ever. Never change, Pop. Never change. The Spurs are zigging when the rest of the NBA is zagging. As the rest of the NBA pushes even further with the three-point revolution, Gregg Popovich’s team is shooting way more mid-range shots than the rest of the league. Led by LaMarcus Aldridge and DeMar DeRozan, the Spurs take 28 mid-range jumpers per game, nearly six more attempts than the next team (the Warriors). So what do you think, Pounders? Do you agree or or do the pundits have it wrong? Let us know in the comments.